The movie that tells you exactly what you can do with your high school diploma! This charming, Academy Award winner (1979, Screenplay) cycles high on comedy as four friends come to terms with life after high school. When top-notch cyclist Dave (Dennis Christopher) learns that the world's bicycling champions are always Italian, he attempts to turn himself into an Italian, driving his parents (Barbara Barrie, Paul Dooley) crazy. But everything changes after he meets the Italian racing team-an encounter that ultimately leads him and his friends (Dennis Quaid, Daniel Stern, Jackie Earle Haley) to challenge the local college boys in the town's annual bike race. $17.702 thousand on 1 screen. Although the term “sleeper” has been used to describe many flicks over the decades, the phrase always makes me think of one specific film: 1979’s Breaking Away. That was the first movie I ever heard described as a “sleeper”, so I will always associate it with the expression. We meet four recent high school grads who live in the shadow of Indiana University. It dominates their hometown of Bloomington and reminds them that they will probably end up with the same kind of provincial lives experienced by their parents and friends. This affects them all in different ways. Dorky Cyril (Daniel Stern) greets his fate with somewhat bemused resignation, and Mooch (Jackie Earle Haley) tries to make the best of it when he marries high school sweetheart Nancy (Amy Wright). The other two reside at opposite poles. Mike (Dennis Quaid) greets life with bitterness. Once the town’s star quarterback, he can’t help but think of what might have been, and he reacts angrily to the ways of the privileged IU students. This gets him in various forms of trouble as he continually butts heads. In particular, he comes up against smug frat boy Rod (Hart Bochner). And then there’s Dave (Dennis Christopher). An excellent bicyclist, he obsesses over the Cinzano riding team and adopts all things Italian to live his fantasy. This mightily grates on his dad (Paul Dooley), who just wants his kid to stop annoying him and move on with his everyday, ordinary life. Matters come to a head after a fight between the guys and a group of students led by Rod. To engender a connection between students and “townies”, the local authorities decree that IU’s “Little 500” bike race will allow a non-college team for the first time. Mike seizes on this as a chance to one-up the spoiled IU kids, and Dave – the key cog in the team – reluctantly agrees. Breaking Away emerges as a minor miracle of a film due to the manner in which it almost wholly avoids its inherent pitfalls. Many parts of the film could’ve – and probably should’ve – gone down the tubes. Dave’s Italian act should’ve made him insufferable, and his dad is so harsh toward the kid that he should’ve been an immensely unlikable character at best, and an ogre at worst. With his anger and bitterness, Mike should’ve lacked sympathy as well. So that’s where the “minor miracle” enters the equation. Partially due to the understated direction of Peter Yates and partially due to warm performances, none of these negatives come to light. Instead, the film takes the clichés and treats them as truths, a method that allows potentially stale material to appear real and fresh. While all involved do very well in their roles, Dooley provides probably the most remarkable work simply due to the inherent negatives that come with his character. During the film’s first half, Dave’s dad comes across as surly, bigoted and downright hateful. Or at least that’s how he should come across. Heck, the old man even wishes Dave dead at one point! However, Dooley plays the role with just enough grumpy charm to ensure that we never dislike Mr. Stohler. He doesn’t deliver the more negative bits with a wink – he keeps the part real – but he adds a sliver of humor to ensure that we can tell Mr. Stohler doesn’t truly believe the mean things he says. Yates’ low-key direction ensures that the good performances don’t go to waste. He makes Breaking Away an economical wonder. I won’t call it “documentary style”, as it doesn’t quite go down that road, but Yates follows events in a subdued manner that lends them an air of reality. Some of this comes from the avoidance of excessive amounts of music. Classical tracks pop up occasionally during the film, but not to a heavy extent, and that means they better accentuate the action. This also allows the natural drama to unfold without manipulative embellishment. Yates’ understated choice becomes particularly valuable during the climactic bike race. While other films would shove cloying score down our throats, Yates lets the material speak for itself. That adds tension to the scene and makes it even more effective. All of these factors contribute to make Breaking Away a charming, timeless tale. With cliché themes of underdogs and “coming of age”, it should’ve been a trite disaster. Instead, it turns into something real. 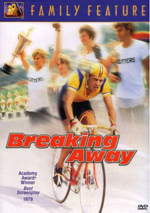 Breaking Away appears in both an aspect ratio of approximately 1.85:1 and in a 1.33:1 version on this double-sided, single-layered DVD; the widescreen image has been enhanced for 16X9 televisions. Only the letterboxed picture was reviewed for this article. While not a total loss, the transfer usually looked pretty bad. Sharpness was mediocre at best. Some shots demonstrated decent delineation, but the majority looked fuzzy and ill-defined. This was usually a muddy presentation. 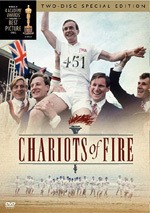 Jagged edges and shimmering failed to occur, but moderate edge haloes cropped up through the film. Colors appeared drab. The movie didn’t boast the most dynamic palette, but it should’ve looked more vivid that this. The hues seemed brown and flat. Blacks were decent, but shadows tended to be somewhat thick and opaque. Source flaws were another area of concern. Some parts of the movie seemed clean, but I noticed many with prominent instances of specks, marks, blotches and nicks. These added to the general ugliness and left this as a “D+” presentation. While not particularly impressive, the film’s stereo soundtrack worked better. Don’t expect much from the stereo imaging, though, as it was indistinct. Music and some effects came from across the front channels, but they did so in a vague way. That meant the elements came from the right and left speakers but I didn’t discern any true localization; it seemed to be similar material simply spread across the forward spectrum. At least the quality of the audio was pretty good. Music fared best, as the classical tracks showed nice range and clarity. Speech was a little reedy at times but seemed good given the material’s age. Effects didn’t have a lot to do, but they offered acceptable accuracy. Nothing here was good enough to elevate my grade above a “C+”, but I felt reasonably pleased with the audio. Expect skimpy extras here. We get the film’s trailer, two TV spots and “Fox Flix” ads for Baby’s Day Out, My Bodyguard, Rookie of the Year and The Sandlot. And that’s all she wrote! 31 years after Breaking Away first charmed my pre-teen self, it continues to delight. Despite the ugly late 70s fashions, the movie hasn’t aged a day. It works its magic in such a quiet, understated manner that it will always succeed. Unfortunately, the DVD is less pleasing. It boasts acceptably good audio but suffers from generally ugly visuals and lacks real supplements. This is a fine film but an unsatisfactory DVD.